Dalkey Tidy Towns is a voluntary community group that aims to keep Dalkey a beautiful heritage town by maintaining the streets and parks in the area. 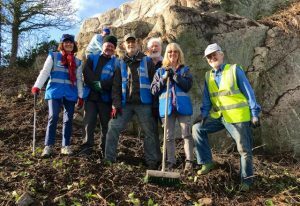 The Dalkey Tidy Towns committee work with many other voluntary bodies to improve our town’s environment, together with the support of Dún Laoghaire-Rathdown County Council. Winner gold medal for the second year. Dalkey Seven Castles: DTT initiated the creation of 7 specially commissioned bronze icons that have been inserted into the pavement along Castle St. at the original castle locations. Dillon’s Park: the restoration of public access to large areas and to vistas across to Dalkey Island that have been lost for years. An ancient well was discovered after the removal of very heavy overgrowth at the lower part of the park. This work is ongoing. Bulloch Harbour: The Harbour Improvement Programme involves working and liaising with the owners Dublin Port. DTT accepted responsibility for the day-to-day Maintenance Programme agreed with Dublin City Port. DTT with Bulloch Harbour Preservation Association spearheaded a major community response to address a large scale inappropriate quayside development at the former Western Marine site. Sorrento Park Summit Viewing Area: DTT completed the installation of the viewing area with benches and a stone compass. DTT continue to press for this park’s restoration for the benefit of locals and visitors to Dalkey. Do you have a free hour or two each week? We’d love you to join us. Our litter patrols operate on Tuesdays, Thursdays and Saturdays from 10.30am. Meet at ‘Writers Corner’, Castle Street. Visit the Dalkey Tidy Towns website and see what’s been achieved and how much more needs to be done.